Israeli soldiers and military engineers installed, Saturday, several surveillance cameras in, and near, villages in the occupied West Bank, in order, according to a military statement, to use them in uncovering and attempting to prevent Palestinian attacks against the soldiers and settlers. 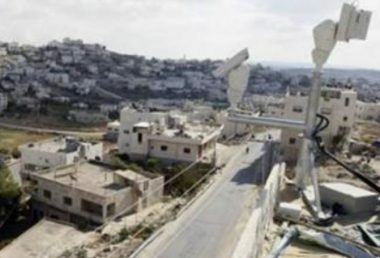 The soldiers installed several cameras on a main road near Janata village, east of Bethlehem, hundreds of meters away from a road used by soldiers and colonialist settlers, especially those heading to Teqoua’ illegal colony. The soldiers also installed surveillance cameras near Kifl Haris village, south of Nablus, in the northern part of the West Bank. Israel has hundreds of surveillance cameras on main roads and junctions, in several areas of the occupied West Bank, as the roads are used by both the military army and colonist settlers, but this marks the first time that such cameras are actually installed inside Palestinian villages, not even used by the settlers. The Israeli army also increased its military deployments on roads where cameras have been installed, apparently in an effort to prevent attempts to destroy them.